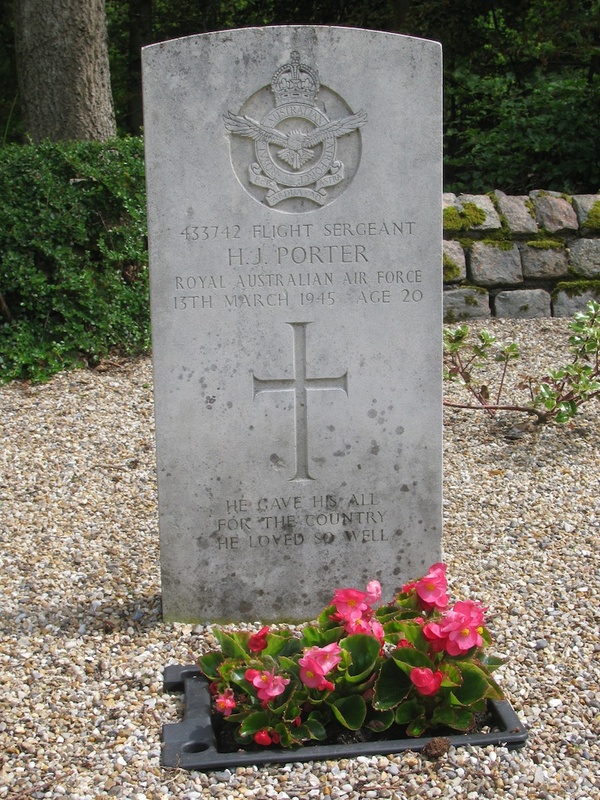 Englændergraven, located near Tarm in western Jutland, Denmark, is the joint grave site of RAAF mid-upper gunner Flight Sergeant Harvey Porter and RAF rear gunner Sergeant Donald Morris who were killed on the night of 12 March 1945 when their Lancater bomber was shot down by a German nightfighter. Of 946 World War II combatants from British Commonwealth countries interred in Denmark, 944 are buried in traditional burial grounds. 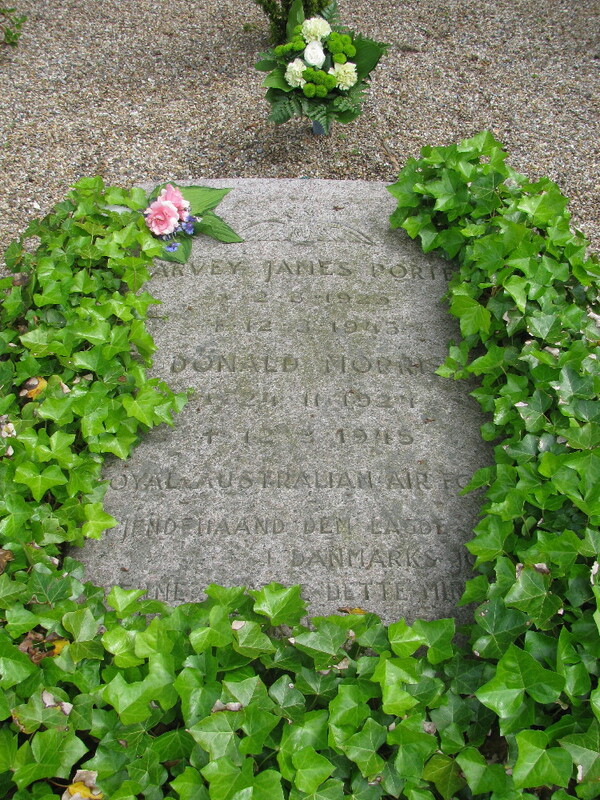 The joint grave site of Harvey Porter and Donald Morris is unique in Denmark in that it is the only Commonwealth War Grave that is not located within a church yard, cemetery, or memorial park. Porter and Morris’s grave site is located beside a wooded plantation near the junction of Ådumvej and Østermarksvej on the south east side of Tarm in western Jutland, Denmark. Although formally designated as the Tarm Isolated Graves by the Commonwealth War Graves Commission, the burial site is known locally as “Englændergraven”, literally the Englishmen’s grave. 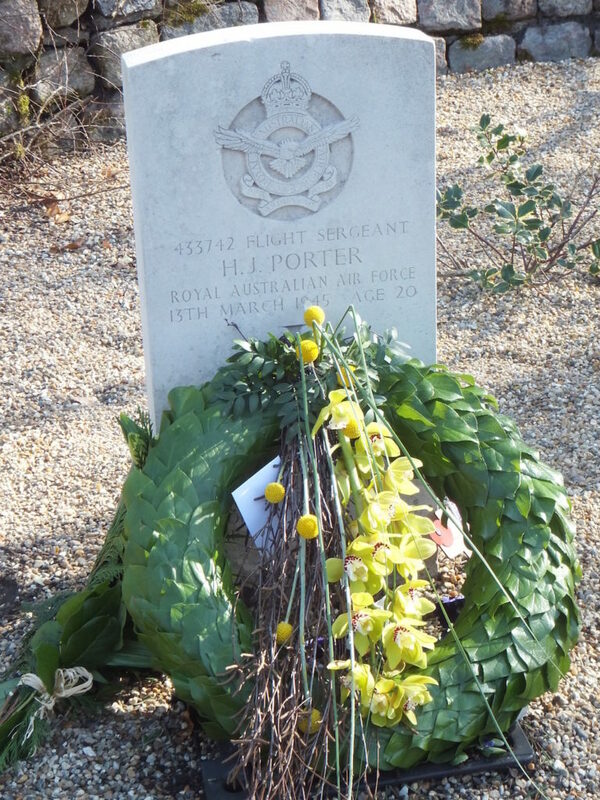 In fact the two airmen buried at Englændergraven are of two nationalities; Harvey Porter from Australia and Donald Morris from Britain. 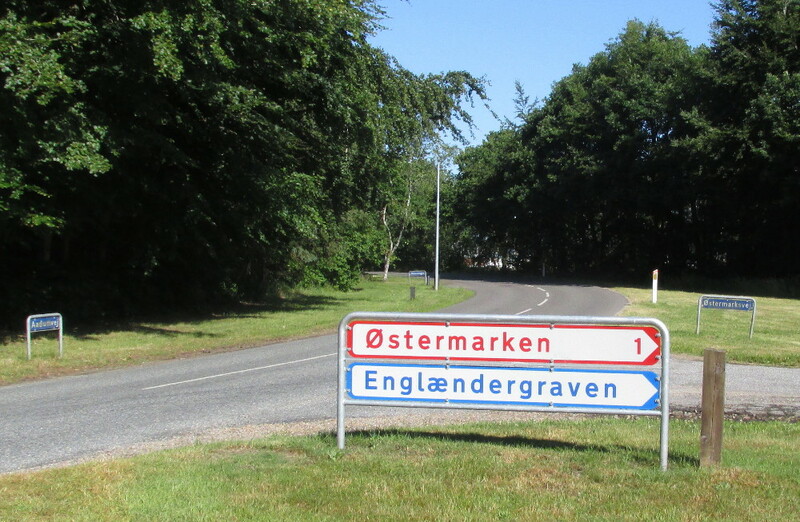 Sign for Englændergraven located at the junction of Ådumvej and Østermarksvej, near Tarm, Denmark. Photograph by Gail Michener, June 2014. 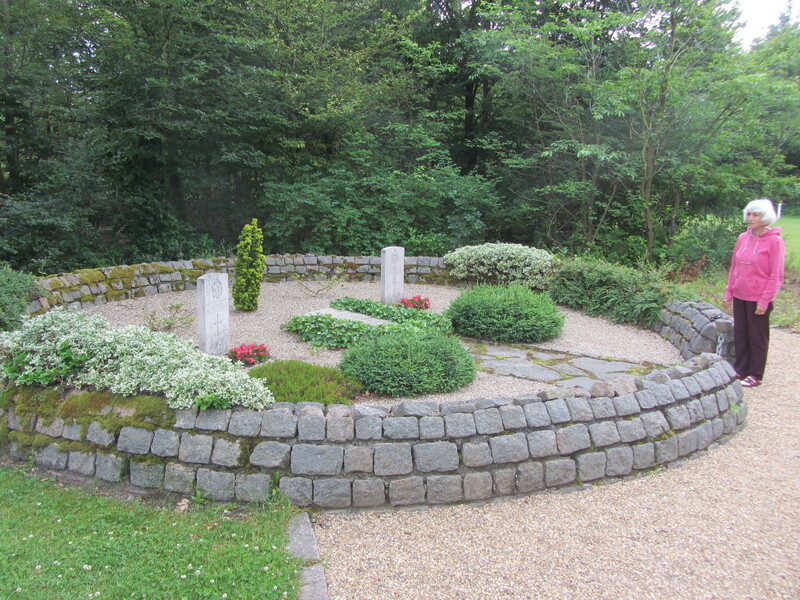 Thanks to the thoughtfulness and efforts of the local Danish people who were offended by the unceremonious way that German soldiers dumped the bodies of Porter and Morris in an unmarked pit, Englændergraven soon became a peaceful garden ringed by a stone wall and marked by memorial stones. Gail Michener, daughter of Stoney Mitchell, standing beside the grave site of Harvey Porter and Donald Morris. Photograph by Dan Michener 3 July 2012. Many people heard and saw the German nightfighter attack on Lancaster ME449 at 2145 h on 12 March 1945. See Eye Witnesses. Danish CB personnel rushed by truck to the crash site, arriving before any German troops. CB men checked that the bomb bay of the Lancaster was empty and they retrieved the bodies from the crashed Lancaster. Harvey Porter and Donald Morris were placed in the truck box, covered with a tarpaulin, and watched over by Hugo Bach Nielsen on the drive to the Tarm Hospital. Night staff at the hospital, including Inger Nielsen (nee Jensen), received the two dead airmen, noted the injuries, washed the bodies, and placed Porter and Morris back in their uniforms. By that time in the war, German protocol required that bodies be buried where they fell. Consequently, when the local German commandant realized next morning that two Allied airmen had been taken from Lancaster ME449 to the Tarm Hospital, he demanded an explanation for the unauthorized treatment of the bodies from Dr. Anshelm Sørensen, chief physician at the Tarm Hospital, and Ingvard Nielsen, a hospital orderly. The Germans then insisted that the uniforms be removed and the bodies of Porter and Morris placed in empty asphalt sacs. 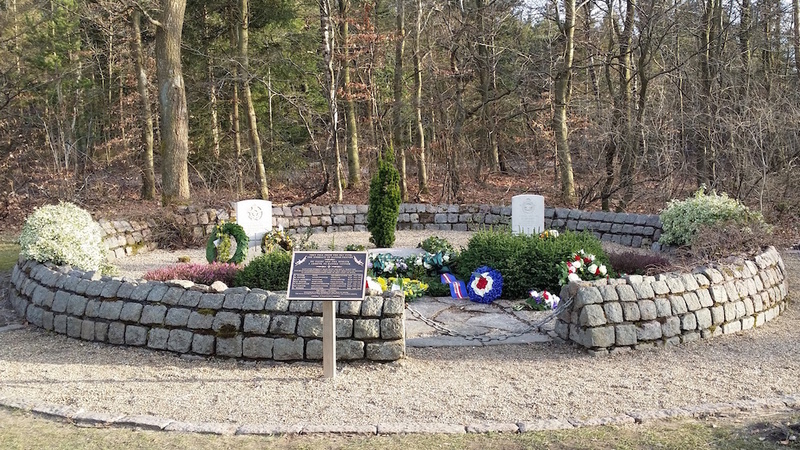 On the afternoon of 13 March 1945, the sacs were loaded on to a horse-drawn cart owned by Christian Andersen, who was told to drive to the outskirts of Tarm where German soldiers ordered the bodies of Porter and Morris to be unceremoniously tumbled into a shallow pit. The Germans did not permit the burial site to be marked in any way and they cautioned Andersen not to reveal the burial location – though in fact the townspeople quickly learned of the site. When word of the impending surrender of German troops in Denmark came on the evening of 4 May 1945, local furniture manufacturer and Resistance member Børge Lerche went with his dog to find the burial site of the two Allied airmen and marked it with two Danish flags, an RAF roundel, and flowers. On 14 June 1945 the local council decided to donate the land at the burial site to Tarm Kirke so it could be consecrated and arrangements were made for a monument to Porter and Morris. Funding for the grave site was raised by means of donations. By August of 1945, a circular ring of stones had been built around the grave site and an inscribed memorial stone laid within the encircling wall. An ecclesiastical funeral service led by Reverend P. B. Gadegård was then held at the grave site on Sunday 12 August 1945. A platoon of British soldiers and about 800 onlookers were in attendance. Memorial stone for Harvey James Porter and Donald Morris at Englændergraven, Tarm, Denmark. Photograph by Gail Michener 14 June 2011. The central memorial stone mentions only the Royal Australian Air Force, to which Harvey Porter belonged. 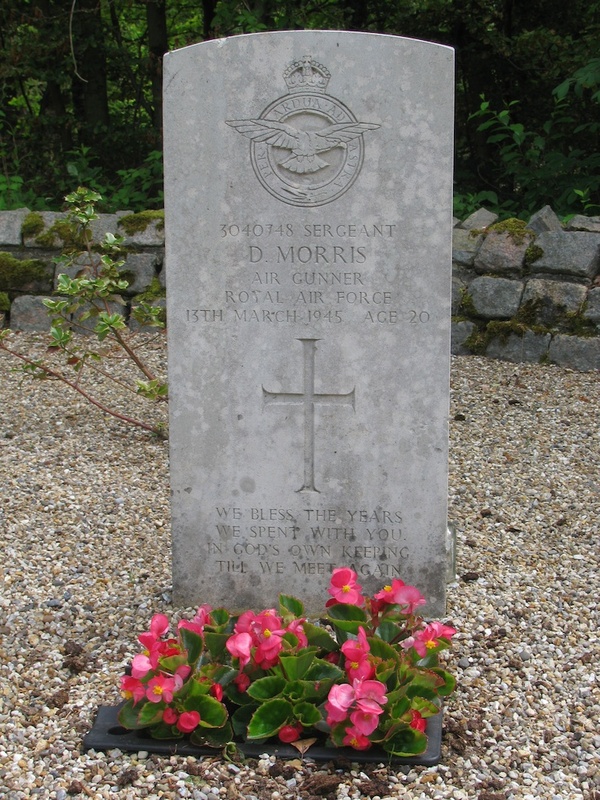 Donald Morris was in the Royal Air Force. In 1961 the Commonwealth War Graves Commission wished to have the bodies of Donald Morris and Harvey Porter transferred to Fourfeld Gravlund, the war cemetery at Esbjerg, but Egvad parish council, Rev. Gadegård, and the parents of Porter and Morris indicated their desire not to disturb the bodies and to preserve the site intact as a lasting remembrance to the two young gunners and the liberation of Denmark. 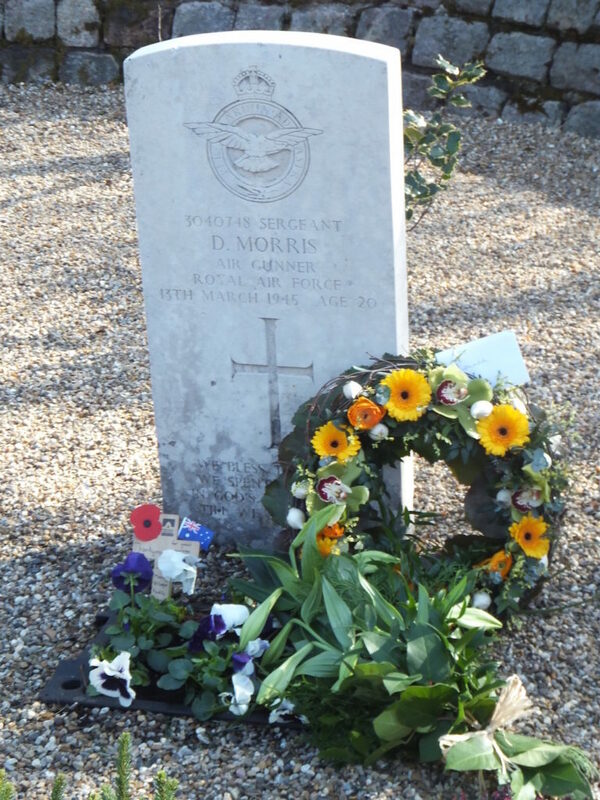 The Commonwealth War Graves Commission honoured this wish and subsequently erected a headstone at Englændergraven for each airmen, with the insignia appropriate to the force for which he flew, the Royal Air Force for Morris and the Royal Australian Air Force for Porter. Harvey Porter and Donald Morris died at or shortly after the time at which Lancaster ME499 was shot down at 2145 h on 12 March 1945. The central memorial stone installed at Englændergraven in August 1945 by local Danes to remember the two gunners gives their date of death as 12-3-1945, whereas the Commonwealth War Graves Commission records the date of death both on the headstones and on the Commission’s CWGC web site as 13th March 1945, the date on which official Danish documents report the previous night’s events. 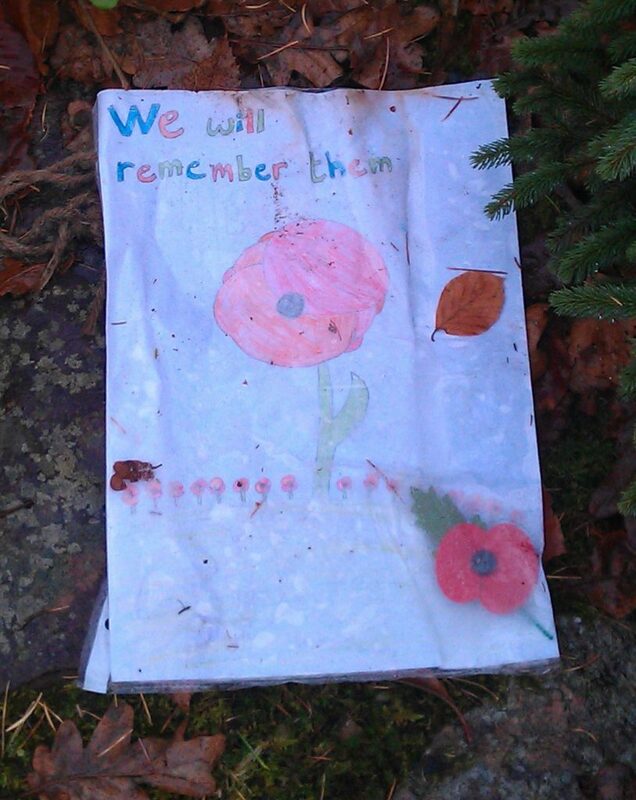 In association with his research on the fates of the seven airmen aboard Lancaster bomber ME449 on 12 March 1945, retired language teacher Børge Rasmussen captured the tragedy of two young lives lost in the form of a poem about why a war grave was located in Tarm. The original poem in Danish was published in Tarm Ugeblad on 28 September 1977. Rasmussen also translated his poem about the “English grave” into English. To read a PDF with the Danish and English versions click Englændergraven Poem. Photograph by Anni Madsen 26 November 2013. 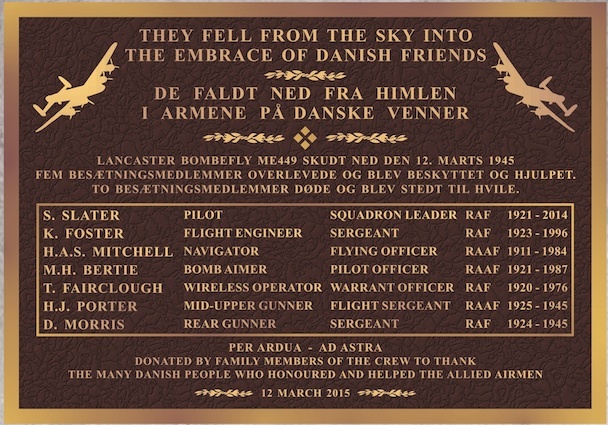 A memorial event was held at Englændergraven on 12 March 2015, the 70th anniversary of the shooting down of Lancaster ME449, to honour the two gunners who died, to remember all the crew, and to recognize the assistance of Danish civilians and Resistance members in retrieving the two bodies and helping the five surviving crewmen to evade to safety. Events at the graveside included unveiling of a plaque, laying of wreaths by family members at the grave stones for Morris and Porter, speeches and wreath laying by dignitaries, laying of wreaths at the central memorial stone by family members of the surviving crew, and laying of bouquets by the general public. 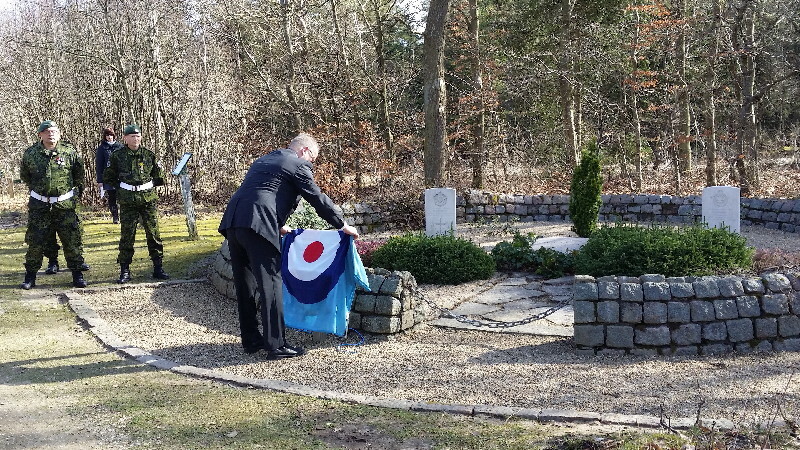 unveiling the memorial plaque at Englændergraven on 12 March 2015.